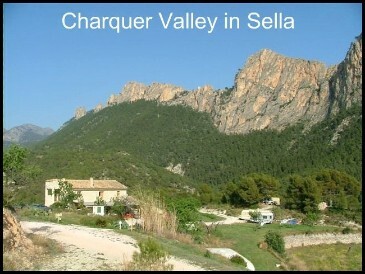 Add the most beautiful valley in Spain to the healthiest holiday area in the world and you arrive here at Charquer 27 near Sella, Costa Blanca - the home of great value, budget holidays. 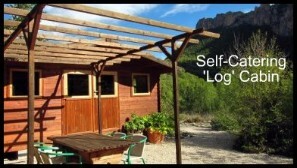 Will you choose the tranquil privacy of your own self-catering log cabin or maybe you'll prefer Bed and Breakfast in the farmhouse. Whichever your taste, you can be sure of a warm welcome from Jeanette, Pete and Granddaughter Kira with personal attention that only a family run Guest House can offer. If you'd prefer to leave the cooking to us then you may like to start the day with freshly laid eggs from Kira’s chickens. 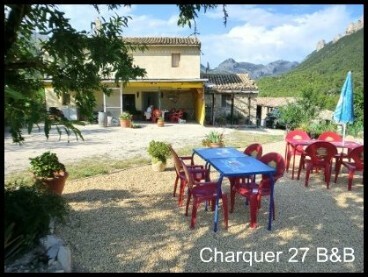 Enjoy home-cooking for lunch and dinner with organic salads, vegetables and fruits, home grown by Jeanette. Our olive oil is newly pressed from our own olives and we have almonds and wild mountain herbs in abundance. The fresh mountain air and the village font water are part of the local magic that will re-invigorate you during your stay.